S.C. Yuan was born in Hangchow, China on April 4, 1911. Hangchow was the capital of China during the Southern Sung Dynasty. Rich in natural beauty it was known for centuries as a center for the arts. Yuan was the eldest of four children. After the birth of his sister, Yu Sun Shen, who his parents favored, he was sent to live with his maternal grandparents 40 miles away in Kuchon. Yuan performed well academically and displayed a talent for art at an early age. His family did not support his interests and wanted him to pursue a more traditional career. Despite their lack of support he was permitted to study at the Fine Arts Academy of the Central University in Nanking with Xu Beihong (also known as Péon Ju), one of China’s most prestigious artists who gave him extensive training in the French academic manner of painting. While Yuan’s studies had been primarily in the Western tradition he was also influenced by the delicacy, and emphasis on line that was present in the Chinese paintings that surrounded him. Shortly after Yuan graduated with a teaching credential, the Sino-Japanese War and World War II had broken out. In 1938 he moved to the new Chinese capital of Chungking and worked as an artist in the cultural department for the Nationalists, handling political propaganda, and as a liaison interpreter for the U.S. Air Force. In 1947 when the war had ended Yuan moved to Shanghai and adopted the English name Wellington, because he admired the Chinese diplomat, Wellington Koo, who was the current ambassador to the U.S. It was also in Shanghai where Yuan was introduced to his future wife, Jen-Chi, the sister of his friend Kai-Zhou Lu, a pilot with the Flying Tigers in the Chinese Air Force. He visited the household often and was commissioned by Jen-Chi’s father to paint her portrait for $3,000. With the Communists taking control of the country, Yuan left China for Jamaica in 1949. In Jamaica he was principal of a Chinese school. In 1950 he was granted a tourist visa to the United States and moved to San Francisco. Here he found a job cooking for the Fairmont Hotel. In 1952 he visited the Monterey Peninsula and was offered a job at The Highlands Inn. He fell in love with the natural beauty of the area and decided to stay. In 1953 he had obtained a position teaching Mandarin Chinese at the Defense Language Institute, and succeeded in persuading Jen-Chi to join him as his wife. On May 23rd they were married at the Church of the Wayfarer in Carmel. In 1954 their daughter Rae was born and they purchased a small home in Pacific Grove. In 1955 Yuan resigned from the Defense Language Institute to paint full-time with his wife’s support. He opened a gallery on Alvarado St. in Monterey and joined the Carmel Art Association. He signed his early Western paintings Wellington Yuan. He exhibited widely in the U.S. and won many awards. An abstract painting he entered into the Monterey County Fair under the pseudonym “Zambini” won first prize. In 1957 they moved to Carmel and Yuan joined the Society of Western Artists. In 1958 their second child died of a congenital heart defect. Grief stricken, Yuan was unable to paint and put his energy into opening a gallery and restaurant on Cannery Row, in Monterey. They called it “Yuan’s.” Unfortunately, there was little demand for authentic Chinese food at the time and the restaurant soon closed. His first one-man show was held in 1958 at the Carmel Art Association and received great reviews. In the 1960 he continued to show frequently and started making lavish trips to Europe and Mexico. He opened two separate galleries in Carmel. In 1969 they opened another restaurant “The Merry Peach” at the mouth of the Carmel River. Mrs. Yuan ran the front end of the business, and S.C. Yuan did the cooking. The business supported the family and allowed Yuan to continue his travels. Yuan was known for being temperamental and moody. He had difficulty dealing with galleries, and the general public. He would price his drawings and paintings erratically and this limited his ability to make sales. In 1972 Yuan’s marriage was suffering. To try to rectify things Yuan hired an architect to help him build her a new house. He spent much of his time painting on the property while the house was being built and continued to exhibit. In 1974 the house was finished, but Jen-Chi would not be moving into the house with him. This was very hard for him. He turned to his artists friends for support. He hung his last show at the Carmel Art Association on September 4, 1974. The next day he put a bullet through his head. He died at 63, the same age his father died. All the paintings from his final show were bought out by Yuan’s friends, and fellow artists. He is remembered fondly as one of the most influential artists to paint in Monterey. Working in oil and watercolor, he produced still lifes, High Sierra snow scenes, European and Mexican scenes, harbor and beach scenes, and seascapes. His painting style submitted to occidental influence and varied from Impressionism to Abstractionism. He is recognized for his muted color palette and bold line. 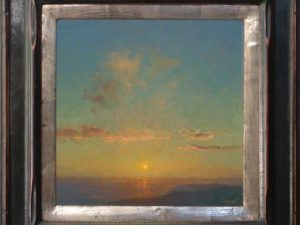 Member: Carmel Art Association; Society of Western Artists. --Edan Hughes, "Artists in California, 1786-1940"